Super easy, healthy and delicious fritters made with a parmesan cheese and garbanzo bean flour base. 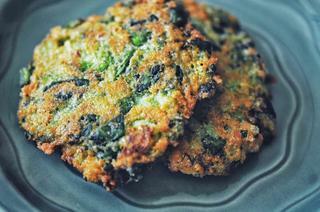 These tasty Serrano Broccoli Spinach Fritters are gluten-free and make a great lunch or dinner! I'm a bit fritter crazy. I find you can make nearly anything into some sort of fritter. And who doesn't love a crunchy & flavorful snack ripe for the dipping? Also (as you may have gathered), I make a lot of fritters...but something about this particular combo proved something special. So, I share it with you . . . Combine all of the above ingredients (except for oil) and mix until just combined.In a skillet, heat a few tablespoons of oil over medium heatUsing your hands, shape your batter into small patties, drop into skillet (you will most likely do this in batches dependent upon size of skillet).Fry for 2-4 minutes on each side, until sufficiently golden brown.Served best with a jalapeno hummus garnished with feta & cilantro. But alas, it is certainly great with any of your favorite condiments!Enjoy.